UPDATE: Dream Cruises just released this render (via CIN) of the roller coaster that encircles the ships funnel. When you zoom out you also see the entire mid-ships area. This all but confirms the existence of a central ‘courtyard’ to me. 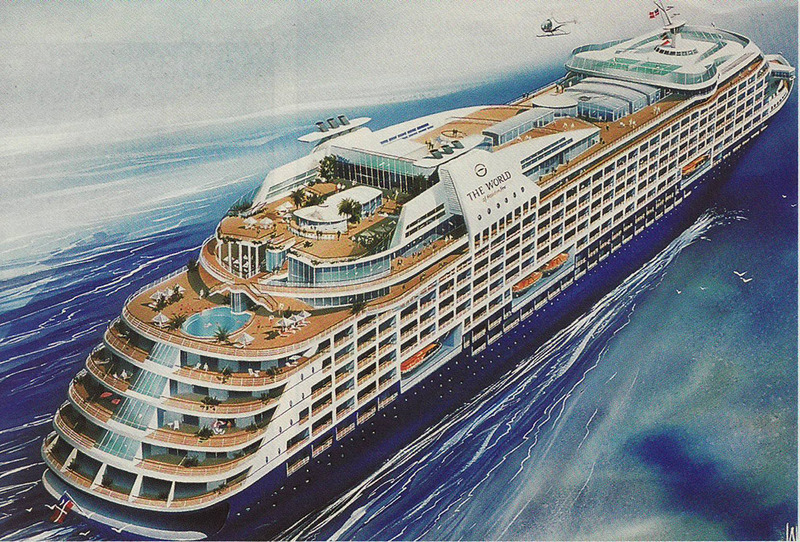 They also show the mid-ships sundeck in more detail. They removed those ‘netings’ and will indeed have a pool area. Perhaps a bit small for a North American ship but perfectly adequate for the ships intended market. Also in between the two vents you see a surfing simulator. 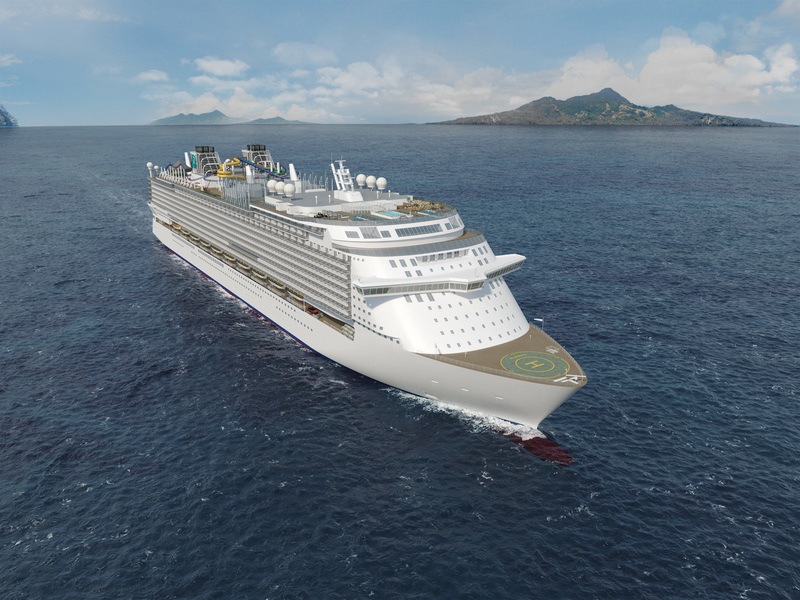 I found these renders of the new Dream Cruises Global-Class vessels. I’ve zoomed in and found some interesting features that haven’t been announced yet. I’ve also taken this opportunity to analyze her complete design. Two things to keep in mind: I’ve zoomed way in so the photos will be grainy and these are just renders so there can be a bit that changes. NCL famously hid the waterfront in their early renders.Also this was what the World of ResidenSea was going to look like. So lets over-analyze a bunch of stuff and all too deep into stuff we’re all too eager to know about and can’t wait for, shall we? Starting at the bow it’s quite striking how much it resembles the Oasis-class. I think we’ll be seeing that a lot in this post. The coloring and even the stair access to the deck below are the exact same. The bridge is a typical star cruises design whereby the center part juts forward. This can be found on all NCL/Star newbuilds that started with the SuperStar Leo in 1998. 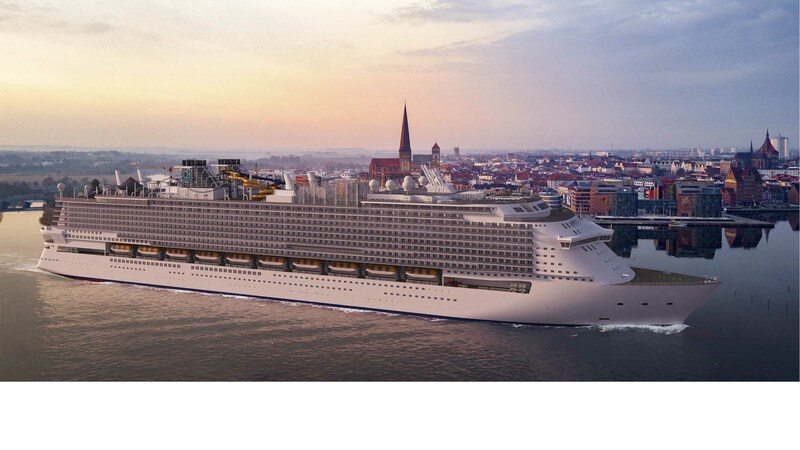 Also I noticed that there doesn’t appear to be any large loft suites or large balcony cabins overlooking the bow. On the top left of the screen capture, there appears to be the suites which are just double-wide balcony cabins. There are also roughly two decks of these larger balcony cabins. They may be just going for sheer passenger count with this design. Moving just a bit upwards, there appears to be an exclusive pool area. A lot of the vessels going to Asia are big on exclusive areas for select guests. Anyone have any guesses as to what’s behind the pool under that glass? Now we reach some of my most interesting finds. The ships being designed exclusively for Asia all seem to not have a big mid-ships pool or even outright lack them. Here we see two screened in courts where the pool areas normally are. Now if we also look closely to where those arrows are pointing we see what looks to be a central park-like area. That’s pretty exciting! There are also two vents that are split which can be and LNG storage tank vent, but I’m not aware that these ships will be LNG powered. The funnels also appear to be split as well, however that’s not indicative of the split superstructure feature. Norwegian Epic features this. Surrounding the funnel is also a roller coaster in what appears to be a first of it’s kind at sea. There will also be 4 intense water slides and waterpark. At the very back there will be an amusement park. That’s what the black, tent-like structures indicate. 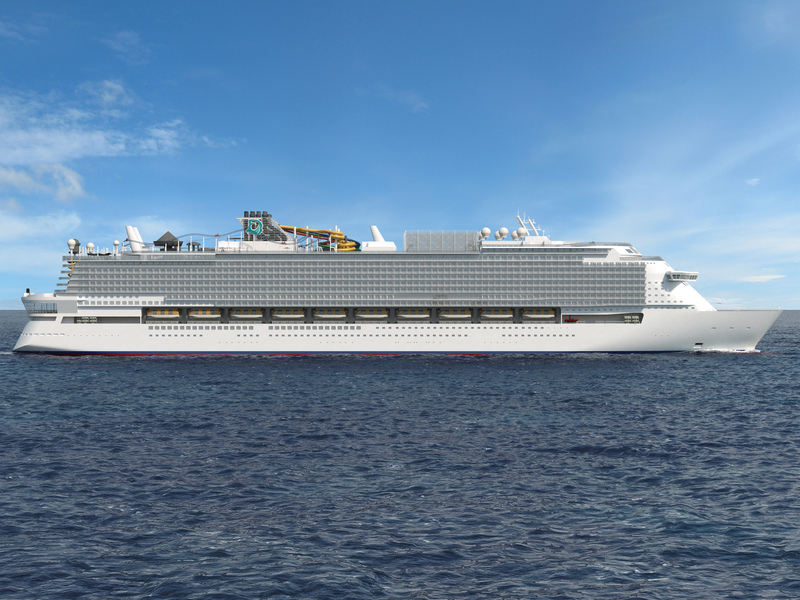 It’s a bit difficult to see in this angle whether or not the back will be split like MSC’s World-class and more famously Royal Caribbean’s Oasis-class. Towards the stern there is a 270-degree view lounge which is becoming all too common on newbuilds. I don’t think that will be a dinning room as the glass doesn’t extend down the side of the ship. 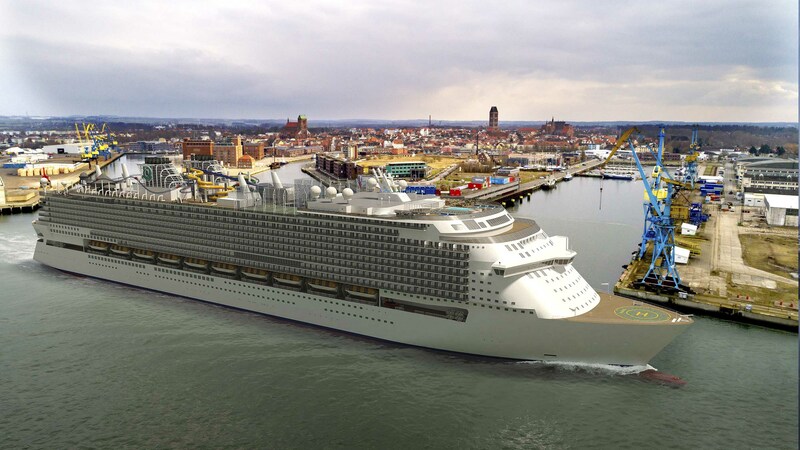 Probably will be a multi-purpose venue just like on the Royal’s Quantum-class and Celebrity’s Edge-class. I then focused on the lifeboats. She’ll definitely not be able to carry the standard 150pax boats and will have to use one of the special high-capacity ones. Currently the largest lifeboats are onboard the Oasis-class of ships. These carry 370pax and are made by Schat-Harding (now Palfinger.) The original boats CRV55 (Oasis and Allure) have now been replaced by the 330pax MPC 39 (Harmony and Symphony). Now the render shows 10 boats on her starboard side, so 20 total. 20 X 330pax/boat = 6,600 life saving capability. This same manufacturer also just trialed a new 440 passenger which are now certified up to 450pax. Most likely these are what will be used here. 20 X 450pax/boat = 9,000 life saving capability. Still not the 9,500 theoretical passenger count that they state but it’s pretty close. Also, it’s my understanding that under the recent SOLAS revisions (I think 2015) that if these new boats are used, then they must be directly above the water. Not recessed into the side of the ship as in the render. This makes the suspect that the render isn’t 100% complete as of yet. Does anyone else spot anything I might have missed?